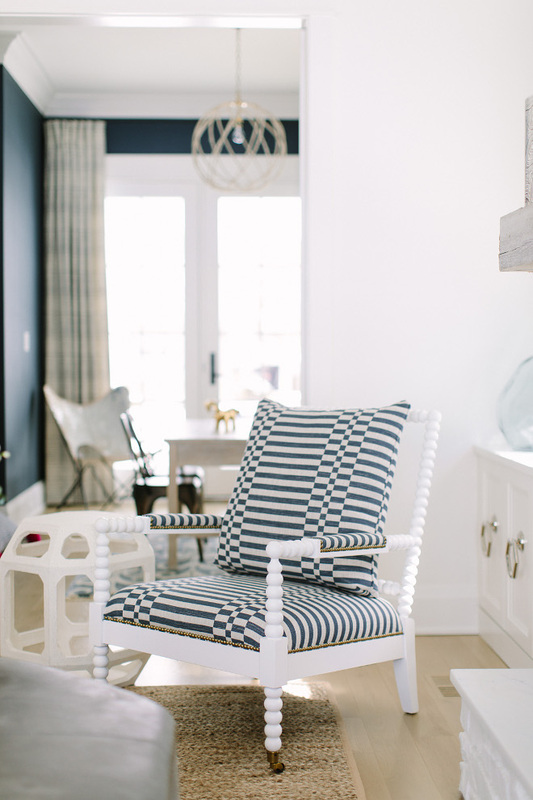 Kate Marker from Kate Marker Interiors knows how to design crisp interiors like no one else! She creates spaces with a current feel and sleek lines without feeling cold, which is not always easy. 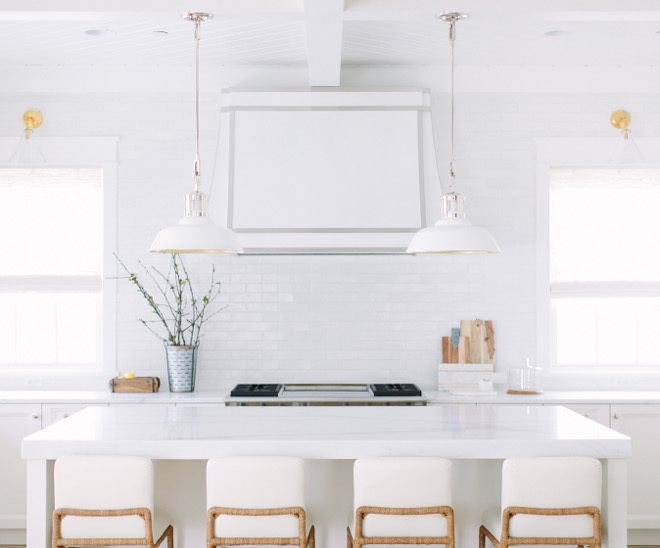 The owners are a couple with two young children who sold nearly all of their belongings to start from scratch to furnish their new construction modern farmhouse. They moved in right as the holidays were in full swing last winter. 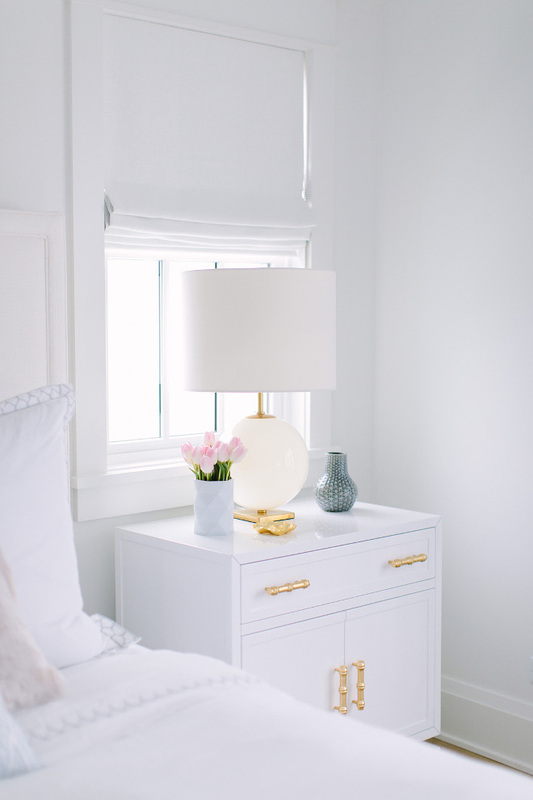 The wife strives to keep things uncluttered and she chose this nearly all white color palette to give the entire home a sense of serenity and cleanness. 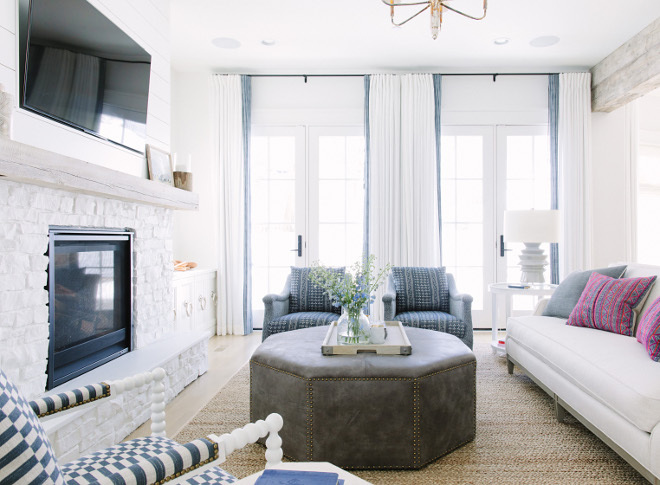 Take notes on paint colors, decor, lighting, all shared by the designer. The foyer is divided in two – the first part features built-in cabinets and durable flooring. 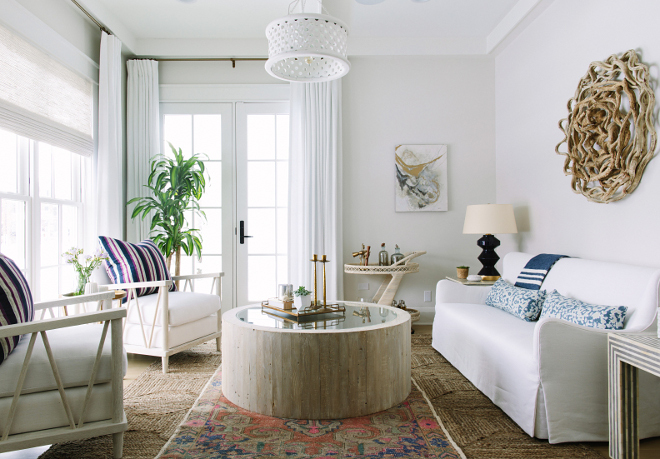 Nearly all walls and trim are Simply White by Benjamin Moore. The vintage runner is one-of-a-kind. 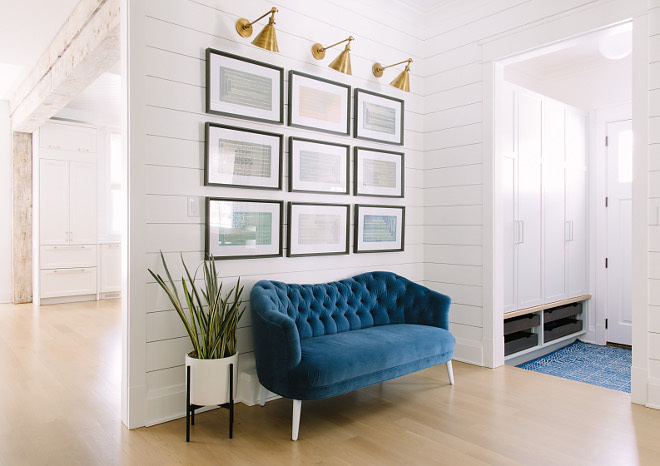 Sofa is from Arteriors and the sofa legs were colored on-site to match the walls. The gallery wall lighting is Visual Comfort E. F. Chapman Boston One Arm Hand-Rubbed Antique Brass Task Wall Light. 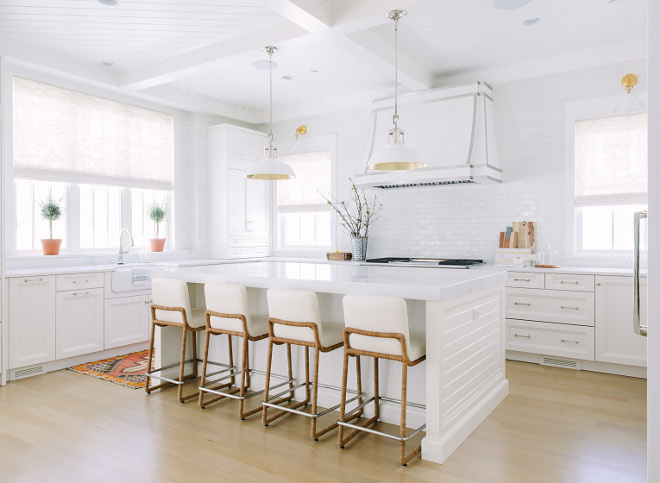 This crisp white kitchen is anchored by custom whitewashed timbers. 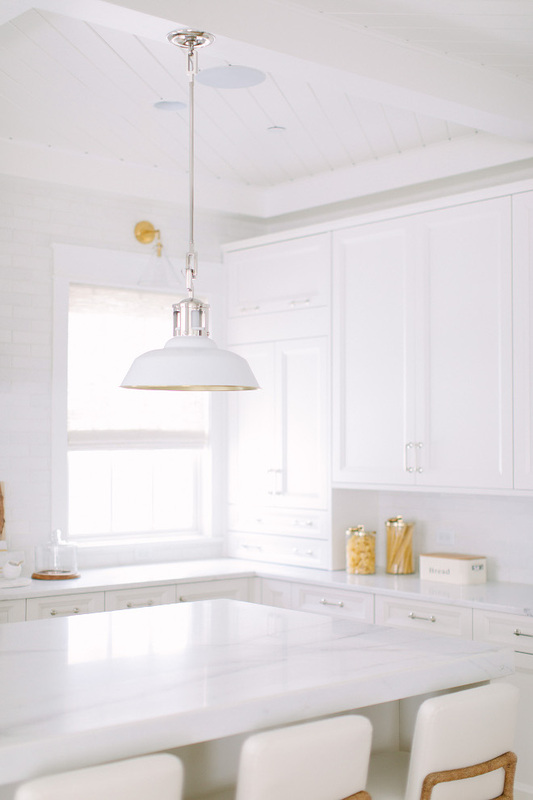 Best White Paint Color for Kitchens: Benjamin Moore Simply White. Kitchen cabinets were done by Wood Mode cabinetry. 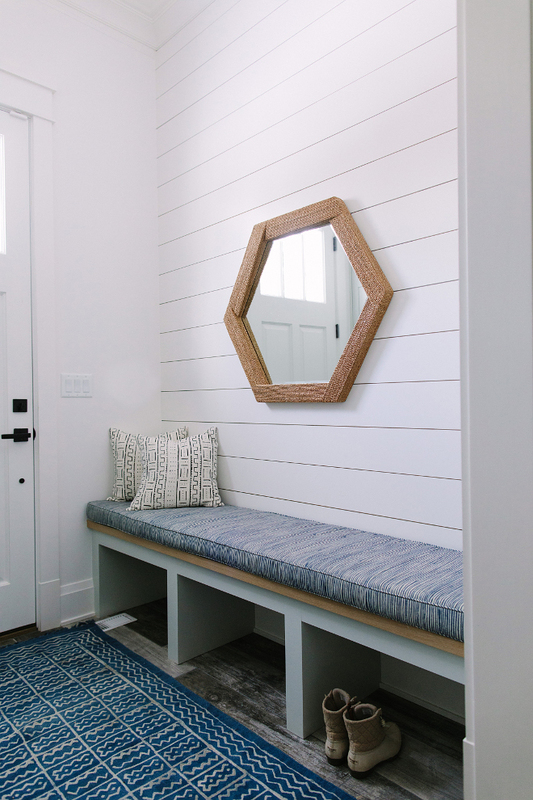 I am loving the shiplap detail on the side of the island. 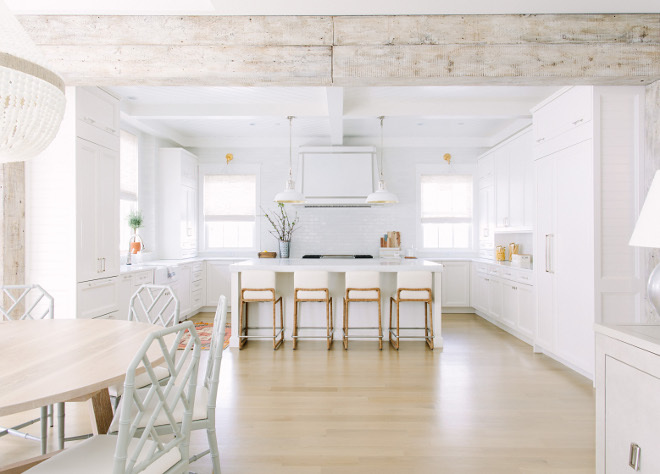 Kitchen Ceiling Treatment: Tongue and groove paneling in diagonal pattern between box beams painted in Benjamin Moore Simply White. 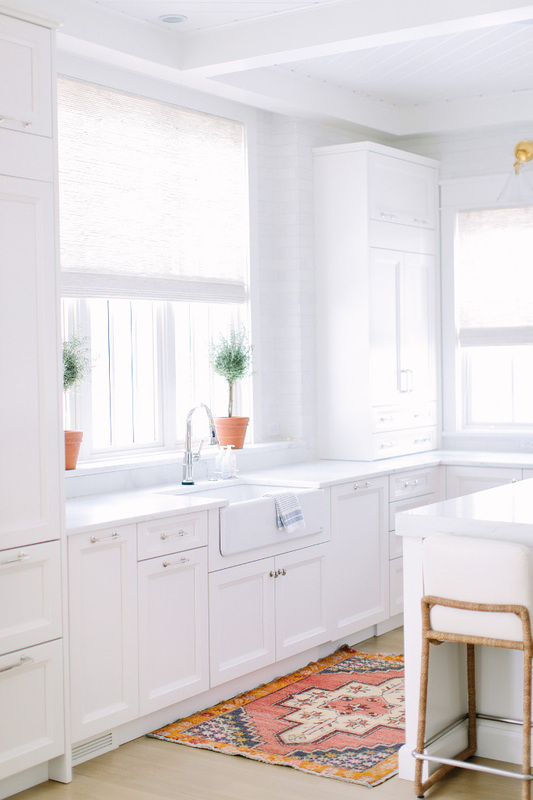 Backsplash is a white Bison Brick for texture with white grout to keep it fresh. 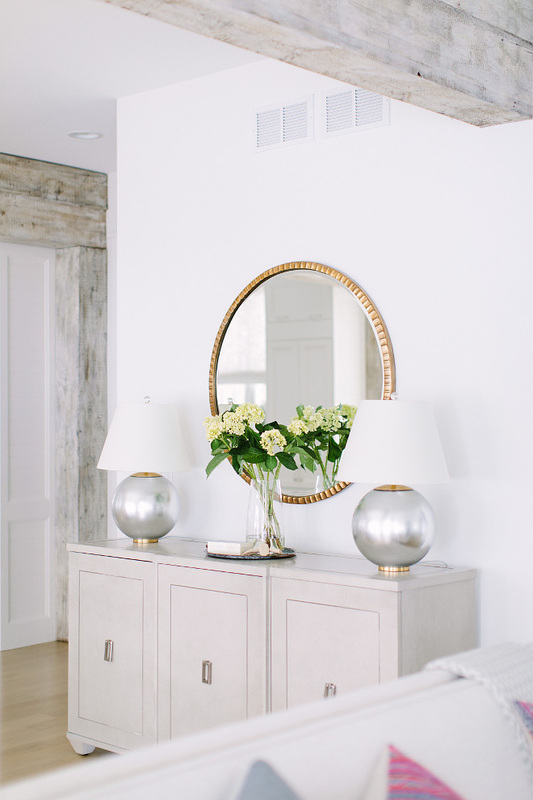 Wall sconces are from Visual Comfort. 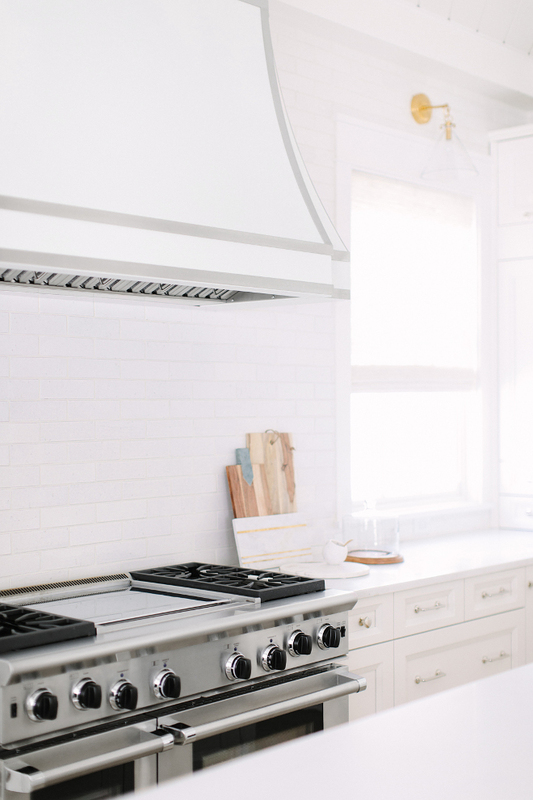 The custom designed kitchen hood features metal strings and some beautiful curves. 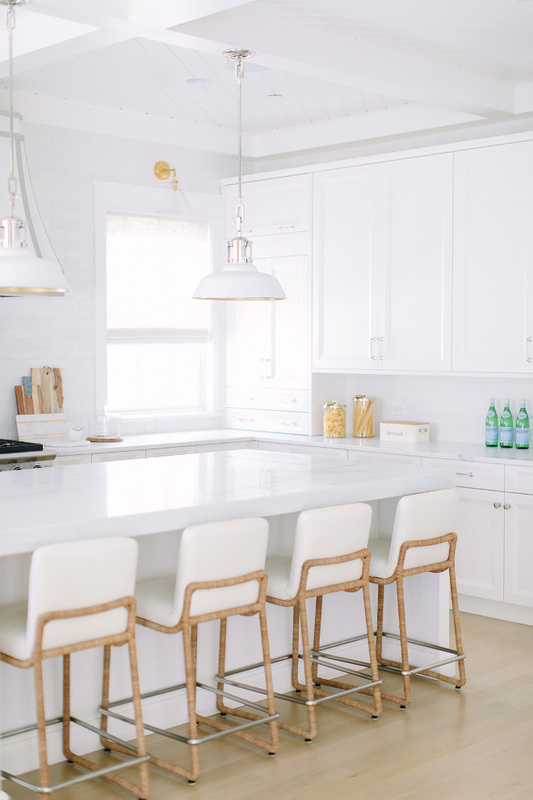 The white kitchen pendants are from Urban Electric Co. The kitchen countertop is Calcutta marble. 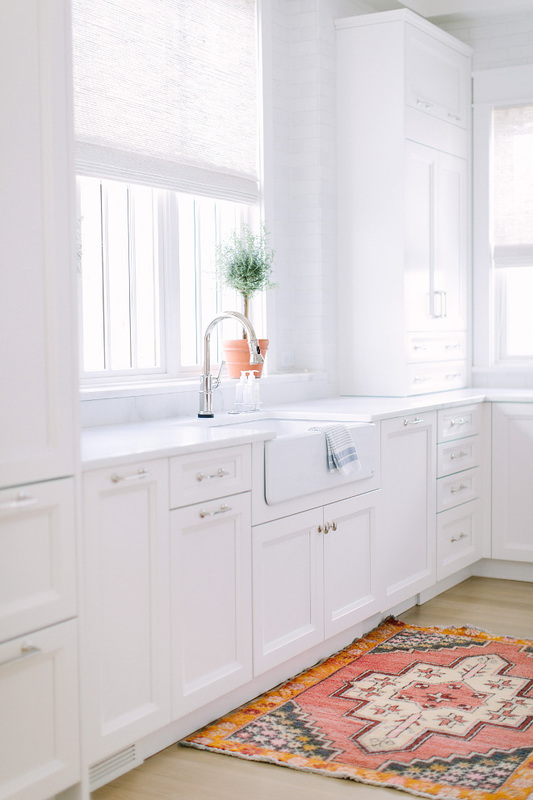 The kilim kitchen runner is vintage. 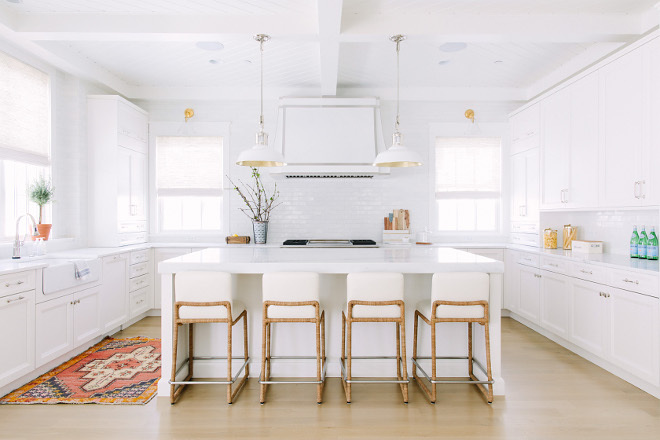 I love how much color a kilim rug can bring to any space! 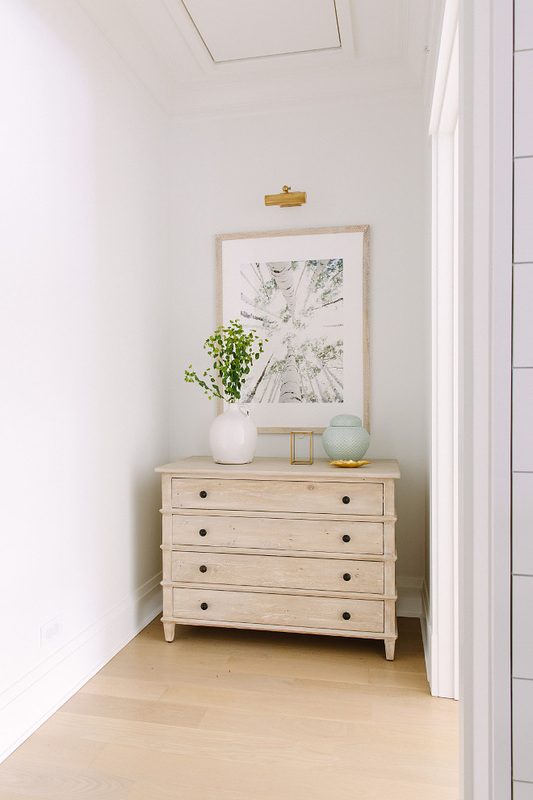 Cabinet Hardware: Alno Hardware – Rockport Collection. 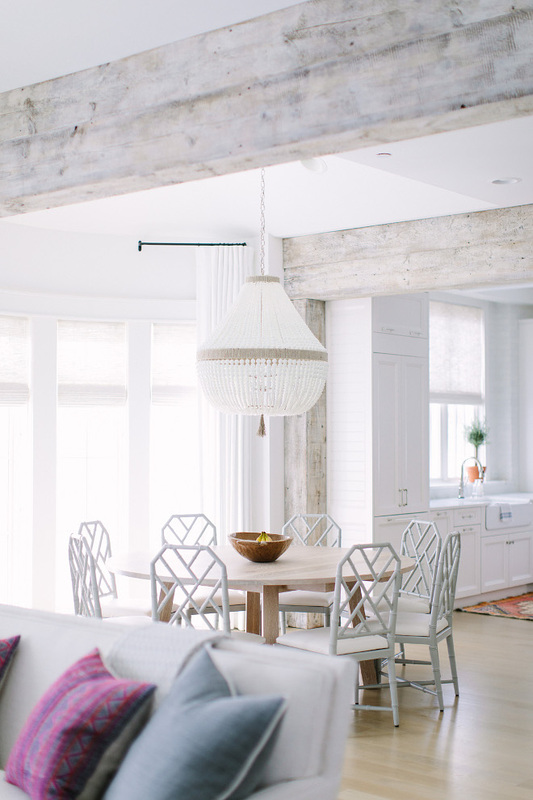 The dining room features thick whitewashed timbers. 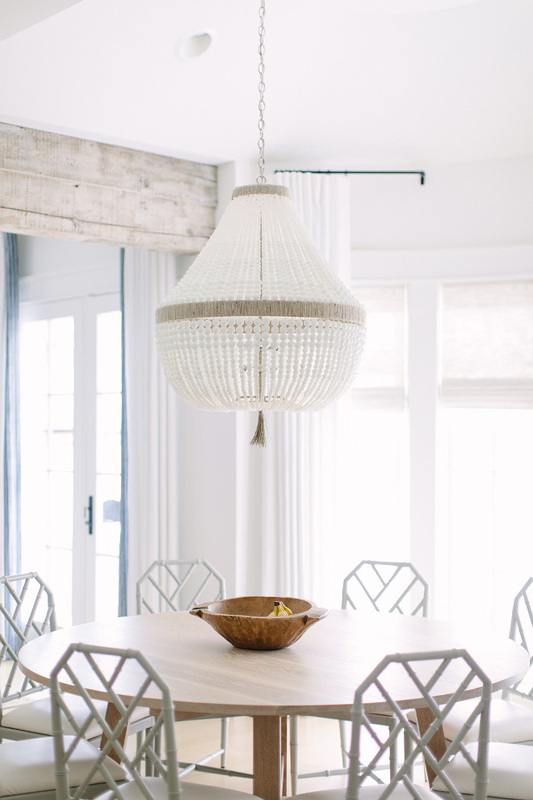 The beaded chandelier is Ro–Sham-Beaux. 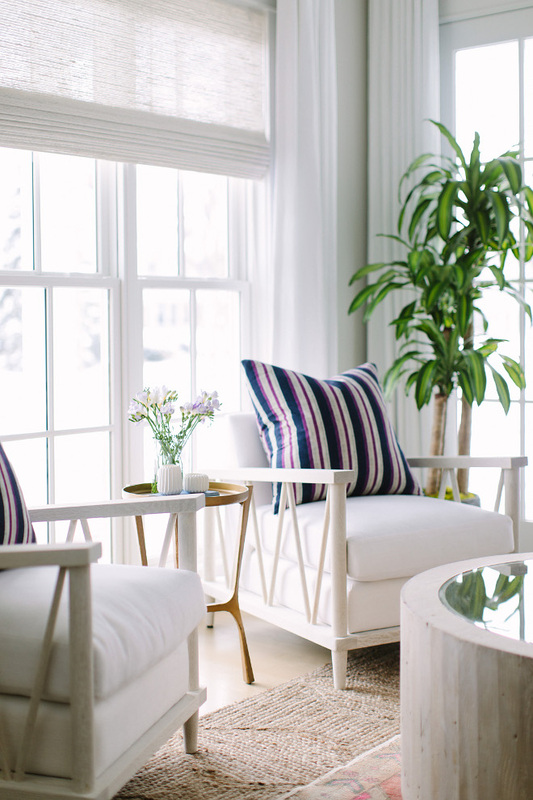 Chairs are by Bungalow 5 and the table is custom by Rest & Repine – it measures 72” diameter with oval extension! The grey sideboard is by Bernhardt. Stunning! The family room feels open, bright and connected to the dining room and kitchen. Sofa is Hickory Chair and the accent table is from Noir Furniture. Leather ottoman is from Lillian August for Hickory White. Great idea on how to decorate a coffee table tray. I love this! 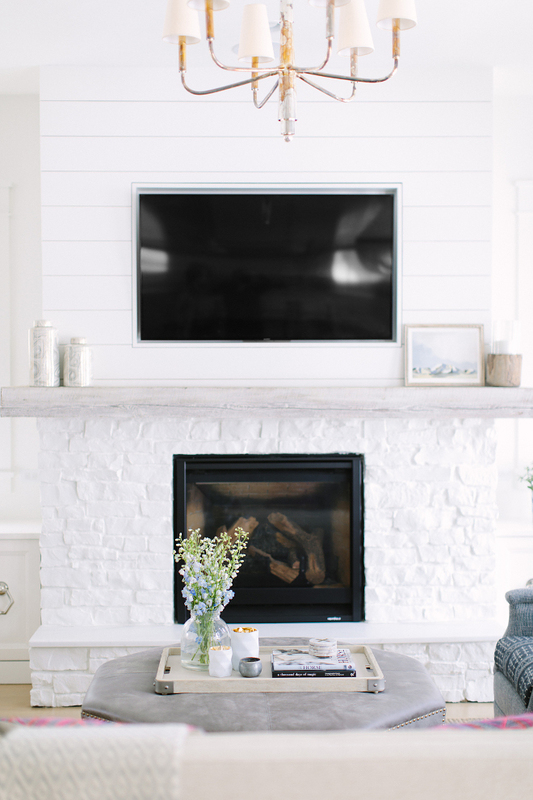 Gorgeous fireplace featuring painted white brick, whitewashed timber and shiplap paneling. Rustic and chic! Lighting is Farlane Chandelier from Visual Comfort. Club chairs are by Lee Industries. They’re very comfortable! Spindle chair is from Lillian August for Hickory White. The family room features glass sliding barn doors which open to the kids’ playroom. 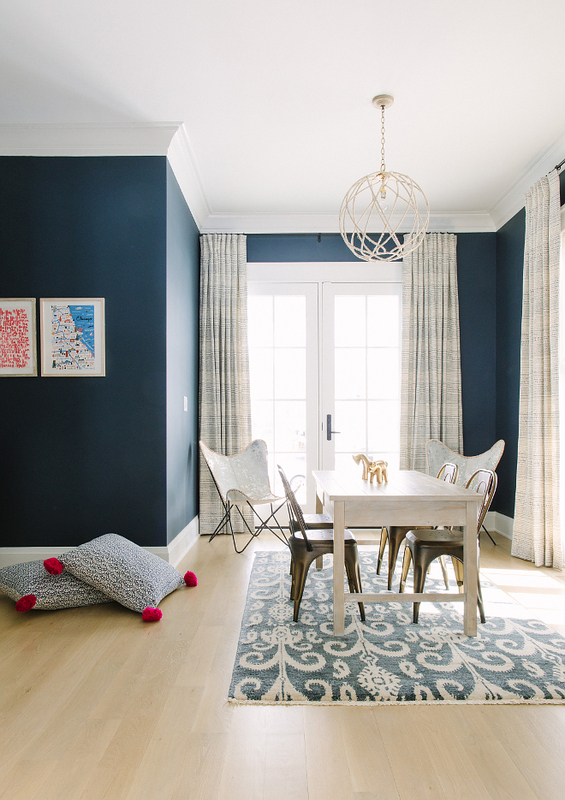 Paint Color: Blue Note by Benjamin Moore. 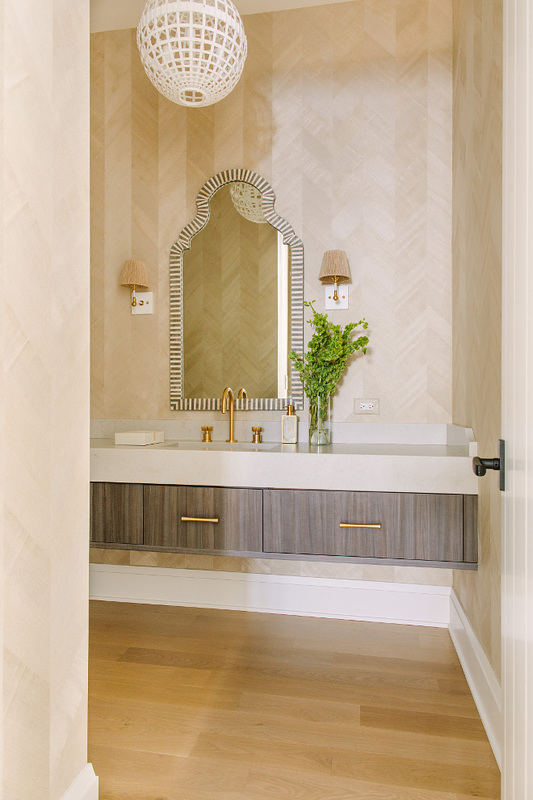 Wallpaper: Phillip Jeffries Wallcovering Vinyl Against the Grain Collection – Wood Chevron – Elm. Lighting is Visual Comfort Mill Pendant. 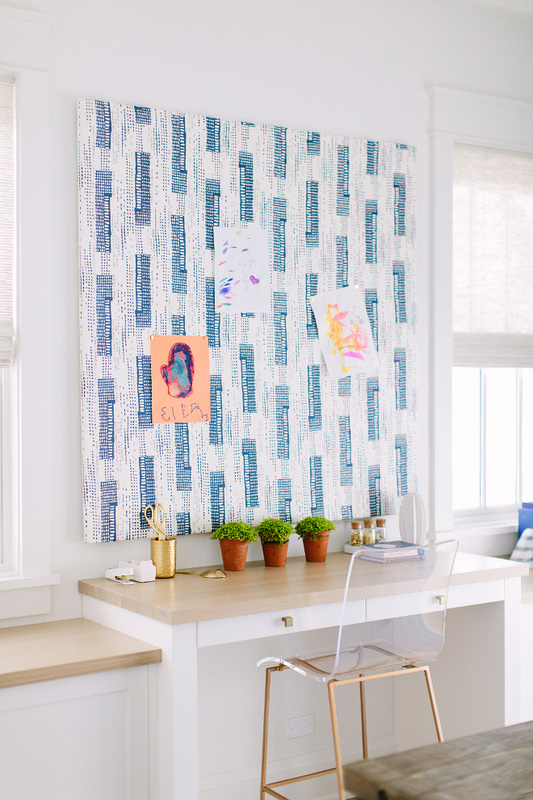 This industrial workstation table is perfect for the kids to do their homework and crafts. Desk is from Four Hands. Lighting is Ziyi by Visual Comfort. The office also features built in cabinets and desk with butcher’s block countertop and a lucite stool. The linen pin board is custom. Lucite stool is from Gabby Home. 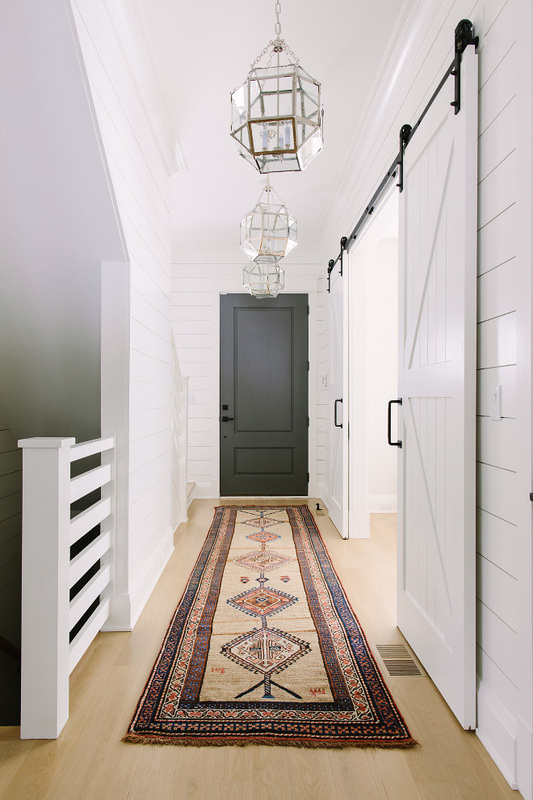 This farmhouse hallway features bleached hardwood floors, shiplap paneling, vintage kilim runner, grey interior door and Visual Comfort Suzanne Kasler Morris lanterns. Main Floor Paint Color: Benjamin Moore OC-117 Simply White. This room feels crisp and layered. Sofa by is Lee Industries. Lighting is Jarrod Small Chandelier by Arteriors. 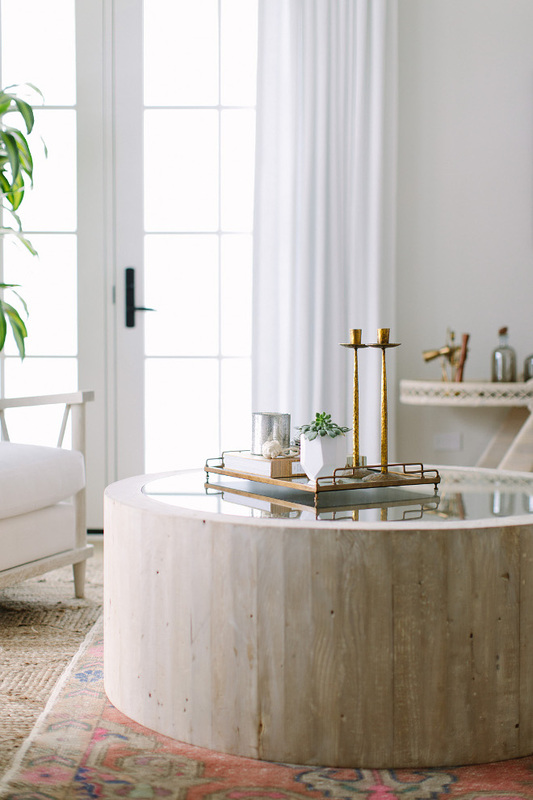 The whitewashed wood coffee table is from CFC. 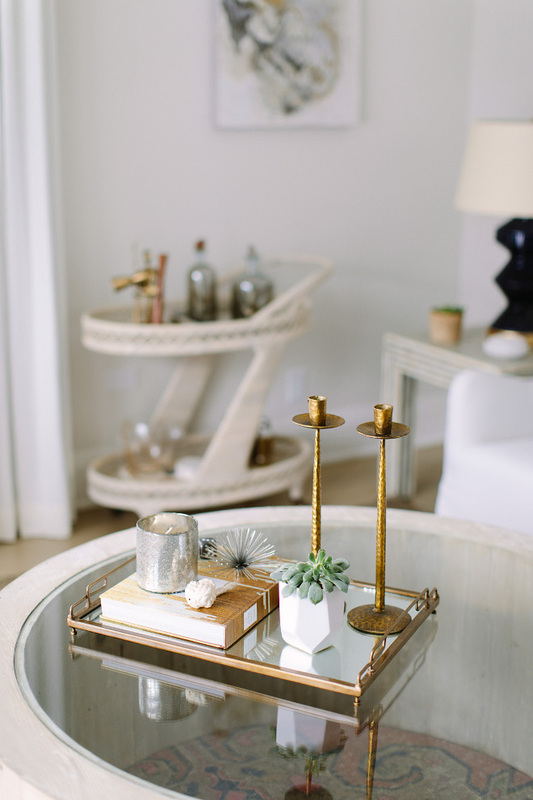 The coffee table decor brings warmth to this white space. The white chairs are by Noir Furniture. 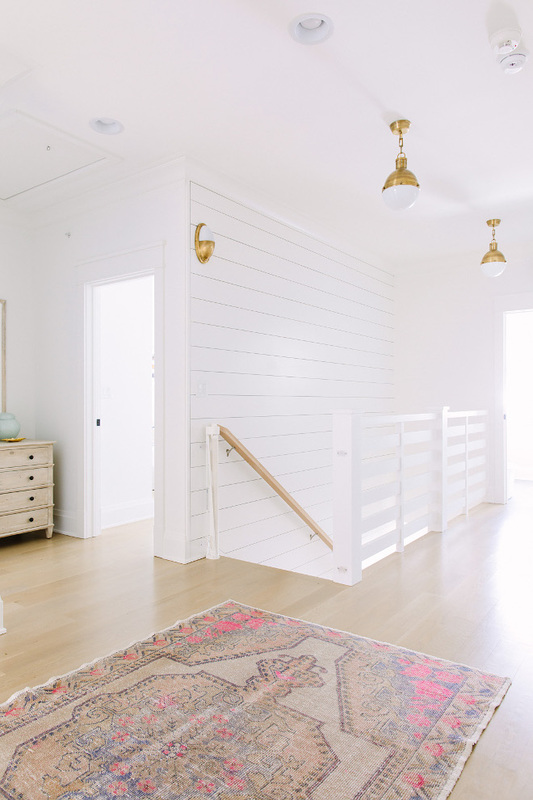 The upper landing features shiplap accent wall and shiplap-inspired staircase railing. Lighting is Hicks Pendant by Visual Comfort. Paint color is Benjamin Moore OC-117. This blush pink color scheme works perfectly for this little girl’s bedroom. Lighting is Ro Sham Beaux. Bed is Lee Industries and the nightstands are by Bungalow 5. 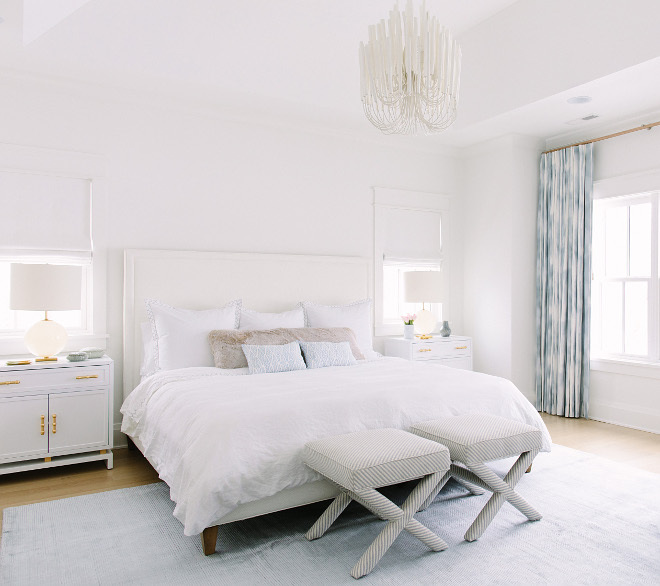 Painted in Benjamin Moore Simply White, this bedroom feels bright and serene. Table lamps are Visual Comfort. Lighting is Tilda Chandelier from Arteriors. The master bathroom is not big but it has a great layout. 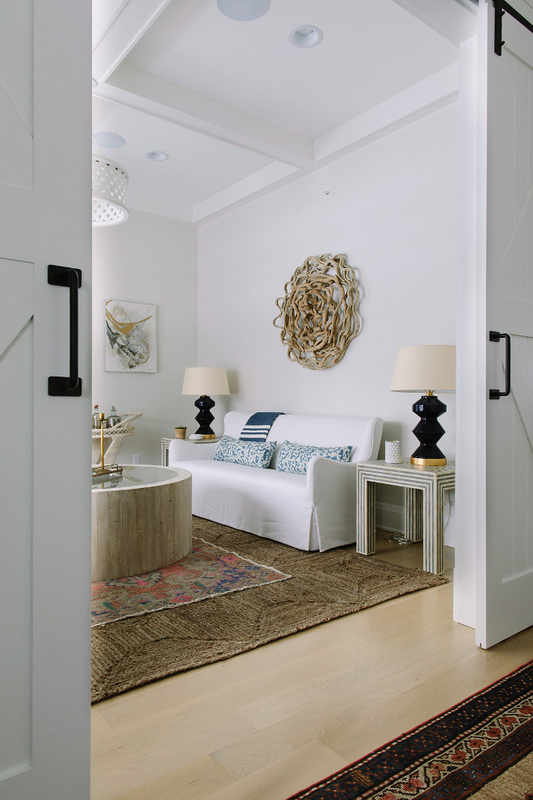 Lighting is Hulton Sconces by Visual Comfort. 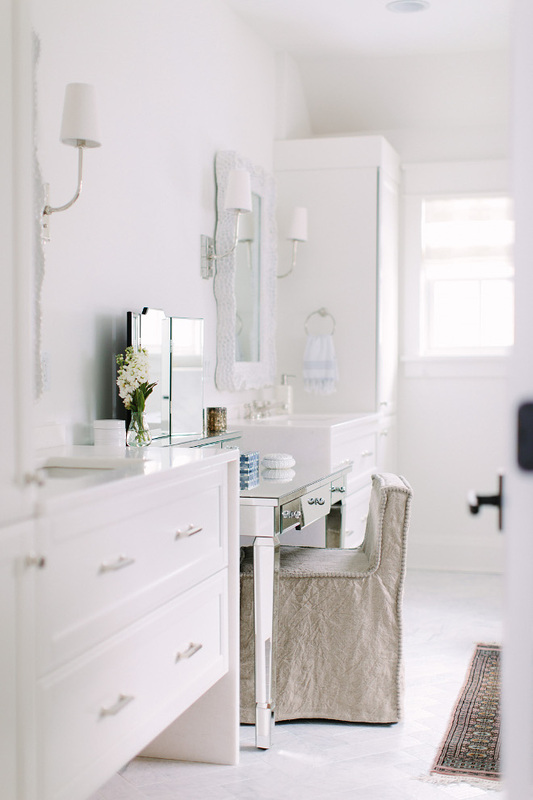 A mirrored make-up table is placed between the sinks while a gorgeous linen slipcovered chair brings texture to the space. 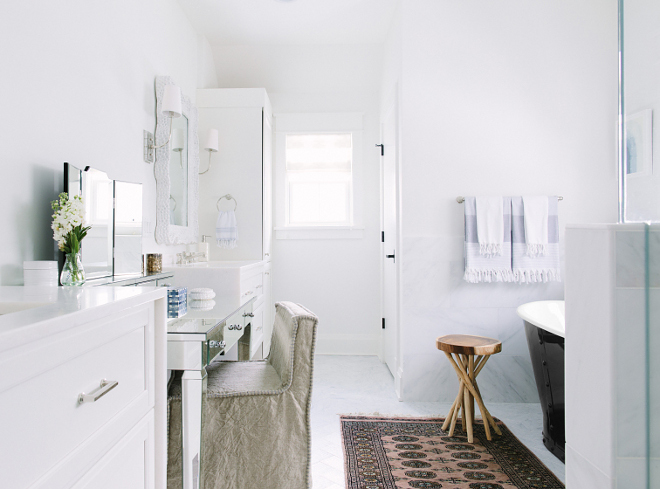 Bathroom also features a black rivet tub and a kilim runner. 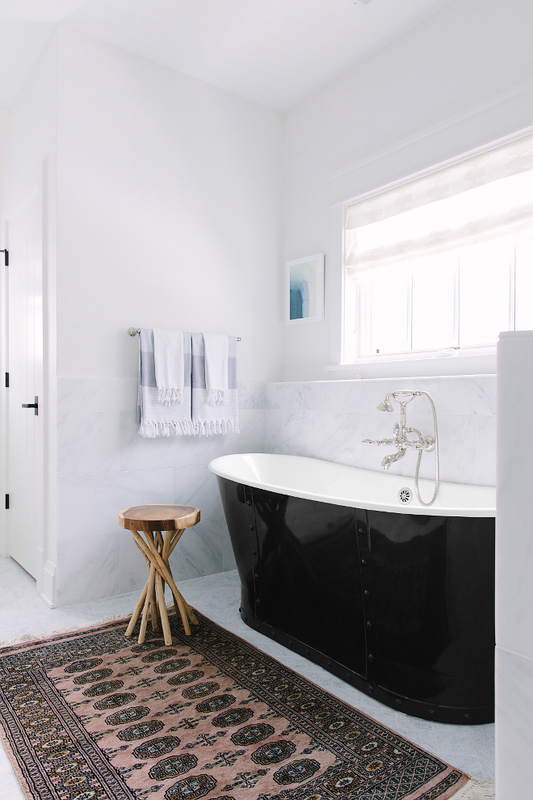 Tub: Bransdale ‘rivet’ freestanding Cast Iron Roll Top ‘Bateau’ Bath. 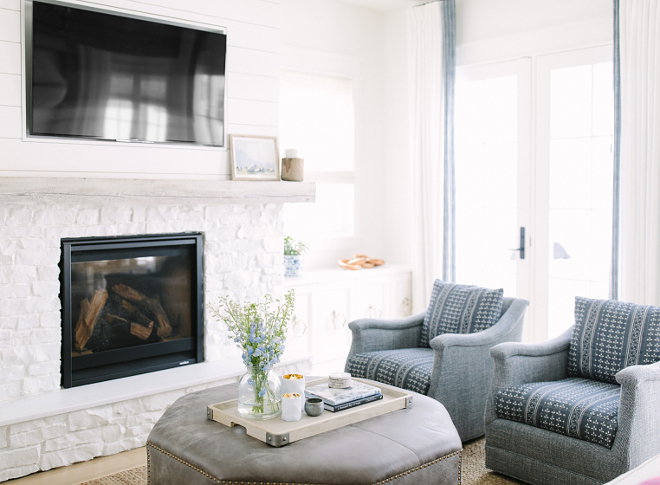 Tuesday: Empty Nester Cape Cod Cottage Design. 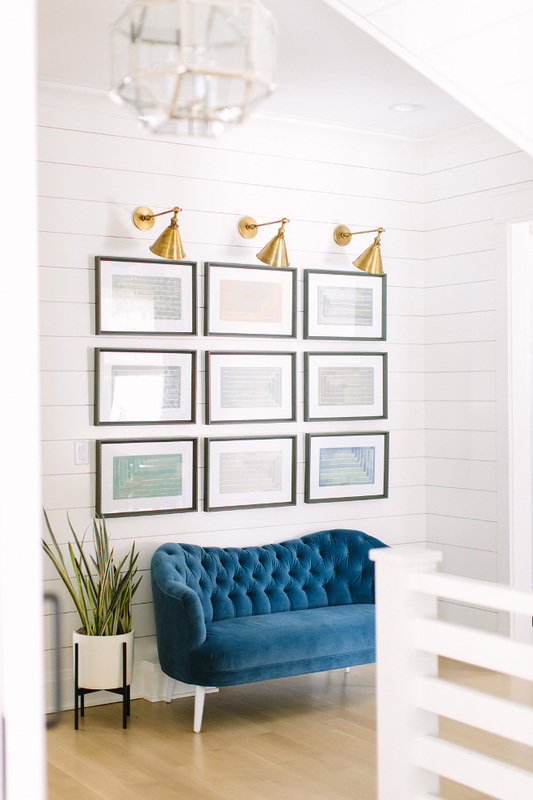 More Interior Design Ideas on Home Bunch. Interior Design Ideas – a weekly series on Home Bunch. 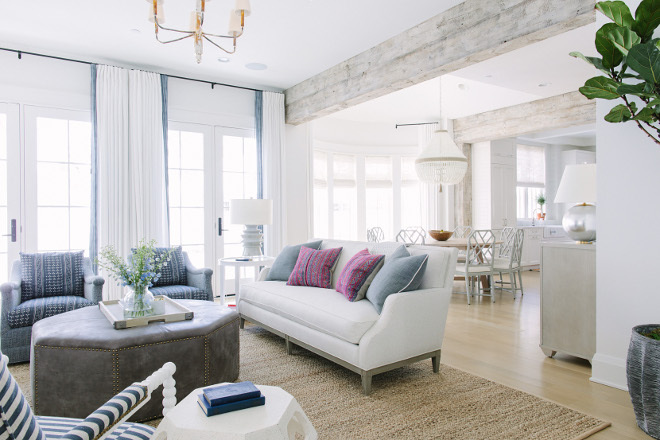 Beautiful post featuring a collection of Farmhouse Interior Design Ideas. Wasn’t it relaxing to see this home? 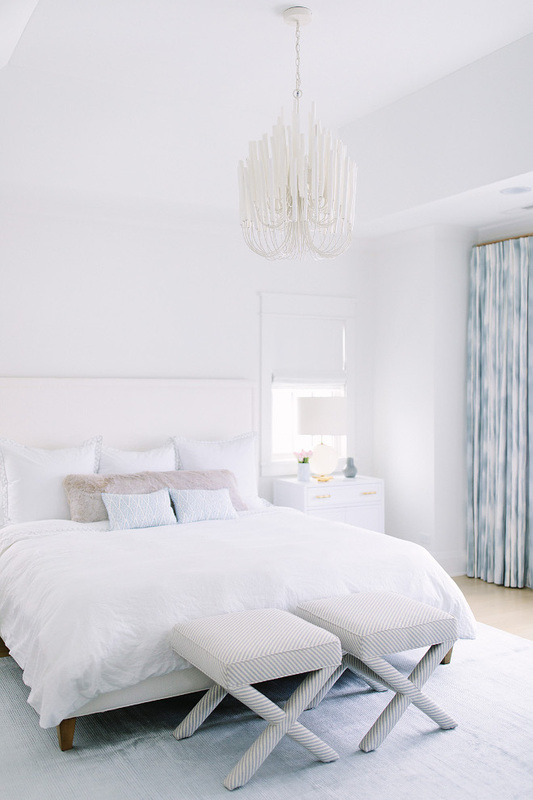 I love how peaceful white interiors feel… I don’t think I could ever feel stressed with this much light! We’ll talk again tomorrow, my friends! 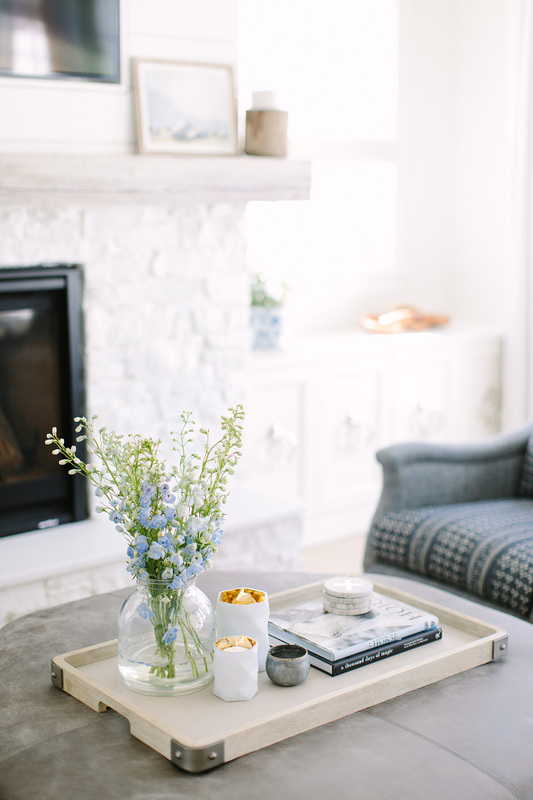 Every day you bring beautiful homes to your blog & I love everything you post. 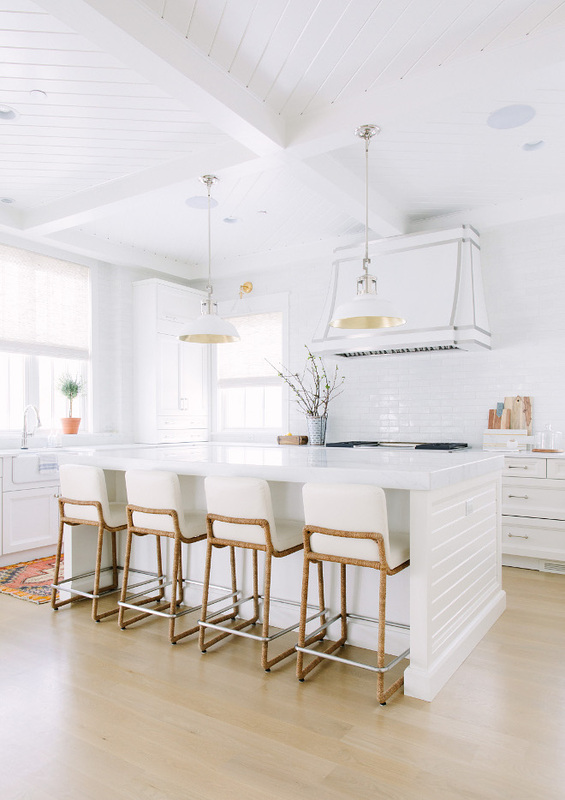 I have scoured the internet trying to find the lovely white pendants from Urban Electric. I am currently doing a reno of my kitchen & would love to take a closer look at these lights. If you have any further details I would be grateful if you could pass them along. Beautiful home by Kate Markers! 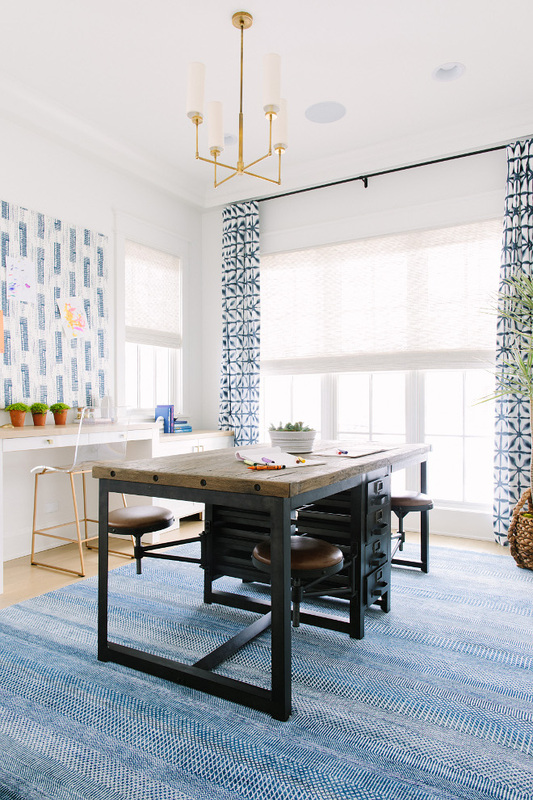 In the home office, she used a blue and white geometric print fabric for the window panels. Would you be so kind to tell me what that fabric is?